I am a boy from Baron Hirsch quarter. I grew up next to the railway lines. I was transported to Auschwitz by train. There, I was executed in a gas chamber. With languages, songs and looms. I shall narrate the history of my ancestors. Thus, I shall also be remembered. CREDITS: The exhibition was produced by the Jewish Museum of Thessaloniki (2013); curated by E. A. Hekimoglou with the assistance of Erika Perahia and Lucy Nahmia; designed by Hybrazil. The curators are indebted to the following archives: Jewish Community of Thessaloniki, Jewish Museum of Thessaloniki, City Planning Office, Municipality of Thessaloniki, History Centre of Thessaloniki, Gennadius Library of Athens, American School of Classical Studies in Athens, National Library of Greece, National Map Library, ELIA, National Bank of Greece, Jewish Museum of Greece, Historical Archive of Macedonia. Bibliography: Studies of Minna Rozen, Rena Molho, Alexandra Yerolympos, Elias Messinas, Gila Hadar, Vilma Hastaoglou. Private archives: Ef. Roupa & E. Hekimoglou, Ch. K. Papastathis, A. D. Papaioannou, B. A. Mavrommatis, We are also indebted to Ellie Ghala-Gheorgila, J. Benmayor, P. Hagouel, Panos Gheorgilas, A. Tsirambidis, J. Capon, Jann Huizenga and Cem Yurt. This exhibition identifies the locations of the old Jewish synagogues in Thessaloniki, after extensive scholar study of official sources. The visitors will be encouraged to recognize the exact location of a significant number of the historical synagogues and the corresponding kehilot in the old urban core of Thessaloniki, i.e. the area included between the modern streets Venizelou, Egnatia, Aghia Sophia and Nikis. The short-term goal of the exhibition is to create a general feeling about the close and recognizable historical relation between any corner of the central business district of Thessaloniki and the Jewish past of the city. The long-term goal of the project is to develop a "theory of place" that would connect the present image of the city to its lost historical memory and thereby establish a new agenda for the ideology of the modern Thessalonians. Kehilot (sing. kehilah) were quasi autonomous Jewish municipal corporations. The religious service of each kehilah was relegated to a synagogue. In Thessaloniki, each kehilah “was a town itself”. More than fifty Kehilot and the respecting synagogues were established in the urban core of the city in the late 15th and 16th centuries. Alas, no remnant of Jewish cultural monuments survives. Although a majority of the population of Thessaloniki was Jewish for the past four centuries, the word kehilot is unknown to modern Thessalonians. The Holocaust destroyed not only the lives of 50,000 Jewish Thessalonians, but also the buildings, the language, the tradition, even the memory of this city. We think of the exhibition as a crack in the mirror of oblivion; Kehilot is a word that should be heard again. Under the dilemma either of obligatory Christianizing or leaving their country, dozens of thousands of Jews from the Iberian Peninsula, Italy, Sicily, Province, Germany, who spoke Castilian, Catalan, Portuguese, Italian, Occitane (langue d'oc), and German, took refuge in the Ottoman Empire, in the late 15th and early 16th centuries; many of them settled in Salonika. The descendants of the Byzantine Jews of the city had been deported to Constantinople in 1454, long before the arrival of the refugees. After the Ottoman expedition in Hungary (1530) some thousand German-speaking Jews were deported to Salonika and Chalkidike. The documents of the present exhibit reveal that the Jewish Community (as a collective organisation) was the possessor of about 10 per cent of the land between Tcharsi-road (the modern Venizelou Street) and the church of Aghia Sophia, perhaps since the Expulsion of 1492. This percentage does not include the individual property of the Salonikan Jews. According to the 1913 population survey, organized by the Greek authorities, approximately 88 percent of the residents in this area were Jewish. 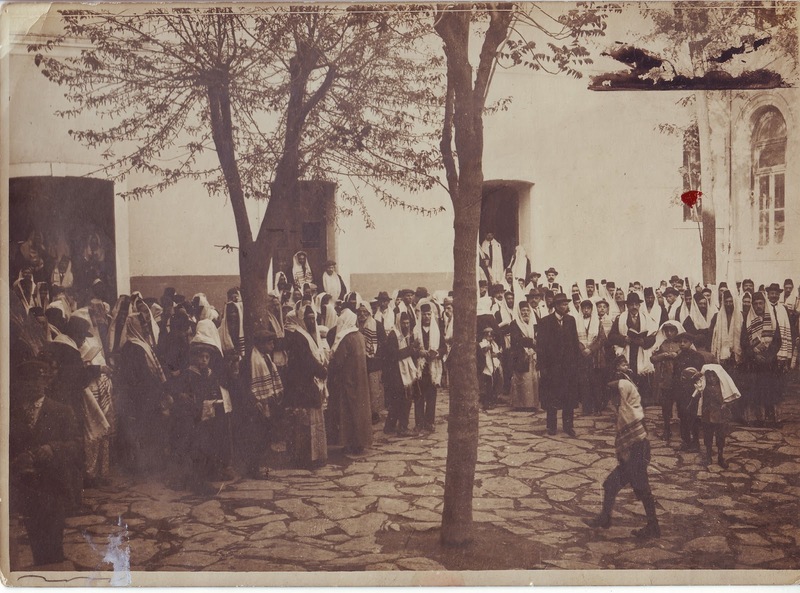 908The numbers illustrate the percentage of the Jewish population in the area between the streets Venizelou and Aghias Sophias, according to the survey held by the Greek authorities in 1913. * In 1520 a devastating fire took place. 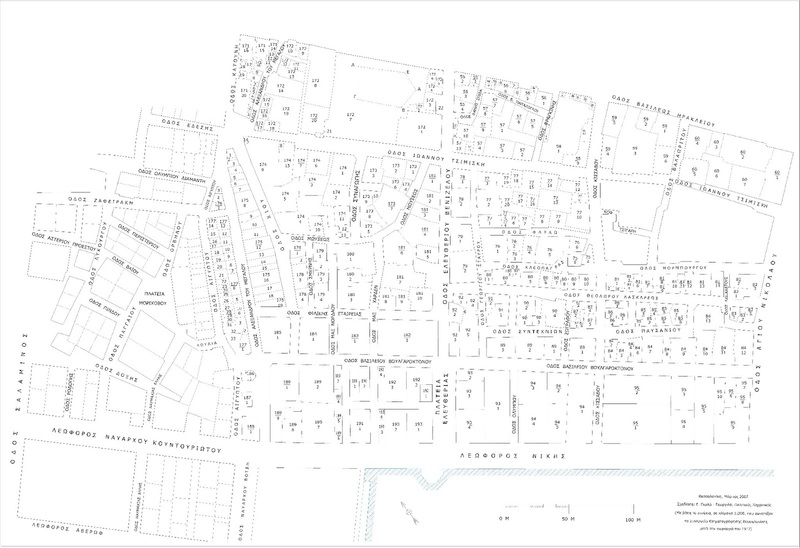 In present spatial terms Talmud Torah was located at the corner of the modern Hermou and Aristotelous Streets and covered the whole area of the modern Modiano Market, the neighbouring Nea Agora and the so called “Kapani” Market. The Talmud Torah complex occupied an area bigger than an acre and hosted many buildings in adjoining interior yards: (a) The central synagogue Talmud Torah, (b) a school bearing the same name, (c) an asylum bearing the same name, (d) an unleavened bread factory (matzah), (e) the Old Sicilian synagogue, (f) the Mograbis synagogue, (g) the New Catalan synagogue, (h) two Lisbon synagogues. This complex covered the city block no 36, which was the biggest real estate inside the walled Thessaloniki. The Jewish Community was the owner in full of the whole area of Talmud Torah, although we do not know how and when its property rights were acquired. It also remains unknown how and when this large estate was formed and when all these buildings were concentrated in the same area, although the indications point to the 16th century. It seems that this was the core of the original area given to the Jewish congregations, when they were established in Thessaloniki:..the land was given uniquely to them [the Jews], and they are its majesty…(written by a hakham in 1509). It is not clear when the Talmud Torah synagogue was founded in the specific point of the city. It is missing from the 1567 tax register, contrary to all the known congregations which are included in this source. On the other hand, sources earlier than 1567 mention the Talmud Torah complex. The Talmud Torah synagogue was burned many times, the last one in 1898, and was rebuilt in 1904. Damages caused by the 1917 fire were not extensive; they were restored very soon and before the end of the year the synagogue housed 39 fire-stricken families, 158 persons in total. A document dated 1920 reports that there were two functioning synagogues with the name Talmud Torah, the so-called Agadol (large) and so-called Akatan (small); we know nothing about the latter. This is a reconstruction of an urban area with the use of a map illustrating the old city plan. The old map was put on a modern map in the same scale (by courtesy of Ellie Ghala-Gheorgila). Air photographs taken by the French Army (1917) were also used (courtesy of the late Prof. Charalambos K. Papastathis). 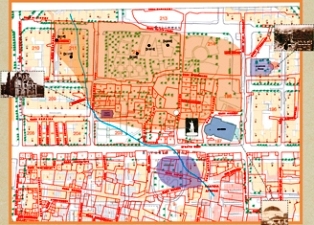 Document 1: (A detail from the Ghala-Gheorgila map): The locations of the following buildings are pinpointed: Yahudi hamam (still existing), Alliance School (at the place of the modern Electra Hotel), Talmud Torah. In correspondence to these three points, the intersections of the old parallel and vertical roads are also pinpointed (A1, A2, A3 and so on). 910. Fifteen identified synagogues formed a semicircle to the south and the east of Talmud Torah complex, i.e. 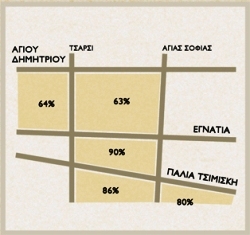 in present terms between Ionos, Dragoumi, and Karolou Diehl streets. According to the deeds, the older the synagogue was, the bigger its plot had been. This is an indication that there was plenty of room for every synagogue when the Sephardim arrived in Thessaloniki. On the contrary, there was a scarcity of space for houses and stores, according to the “askamot” which were published in that period. In the period 1882 to 1917 no changes occurred in the city plan concerning the area to the south of Talmud Torah. We come to this conclusion by comparing the 1917 map and the detailed map which was compiled by the Ottoman Army in 1882 (published by Hekimoglou & Danacioğlu). In the same time, the inner deadlocks in the area to the east of Talmud Torah were aligned and widened, but the city plan saw no dramatic changes. Consequently, the location of the identified synagogues in both areas must have been very old. On the contrary, the old Küçük Pazar (= the small periodic market) to the south-east of Talmud Torah was demolished and a new city plan was put into effect in the area, although the property ownership did not change. The fifteen identified synagogues which formed a semicircle to the south and the east of Talmud Torah complex included some of the older synagogues in Thessaloniki, which were mentioned in the 16th century sources. The locations of these synagogues are geographical proofs that the original core of the Jewish refugees was much greater in size than the Talmud Torah complex. Shalom: The area of the plot was 807 square meters. Apulia: The area of the plot was 540 square meters. Calabria Gerush: The area of the plot was 436 square meters. Katalan: The area of the plot was 426 square meters. Provencia: The area of the plot was 403 square meters. Otranto: The area of the plot was 236 square meters. Castilia: The area of the plot was 220 square meters. Hargavoah: The area of the plot was 357 square meters. Beit Yosef: The area of the plot was 300 square meters. Majorca: The area of the plot was 258 square meters. Italia Hadash: The area of the plot was 147 square meters. Beit Yuda: The area of the plot was 145 square meters. Ezrati: The area of the plot was 124 square meters. Beit Abraham: The area of the plot was 105 square meters. Beit Isaac: The area of the plot was 104 square meters. This illustration pinpoints the synagogues on a photograph of Thessaloniki, which was taken from an airplane after the fire of 1917. Most of the synagogues were repaired after the fire and gave shelter to hundreds of fire stricken families. Reminder: Only synagogues identified on the basis of legal documents (deeds) have been pinpointed. After the Ottomans conquered Thessaloniki (1430) three hundred Muslims settled in the neighbourhood of Kataphyge and lived among the Christian residents. The newcomers used three mosques, one of which was Kadi Abdüllah (Block 221). The tax register of the year 1500 reports 51 Muslim male adults, including bakers, tailors, bath-keepers, and ex-slaves. The Sephardim established in Kataphyge in the late 16th century, perhaps after the great fire of 1520. The old (black lines) and the new (green lines) city plan of the Rogos area. The surviving old buildings are marked. The Flour Market (Un Kapanı) was situated between the core of the Jewish establishment (Talmud Torah) and the Rogos neighbourhood. Rogos and Un-Kapanı areas were crossed by a river, along which water-mills were located. Portuguese and Sicilian Jews bought land and established in the area beyond Kapanı and the river. This settlement was a great step and may be understood only in the context of extended urban changes. Portuguese and Sicilian Jews had already established in Rogos neighbourhood, when the Shabetai movement affected the Jewish Community (late 17th century). A number of Jewish families converted to Islam (Dönme). The mosque of Kadi Abdüllah became one of the main Dönme mosques, especially of the Karakaş sect. 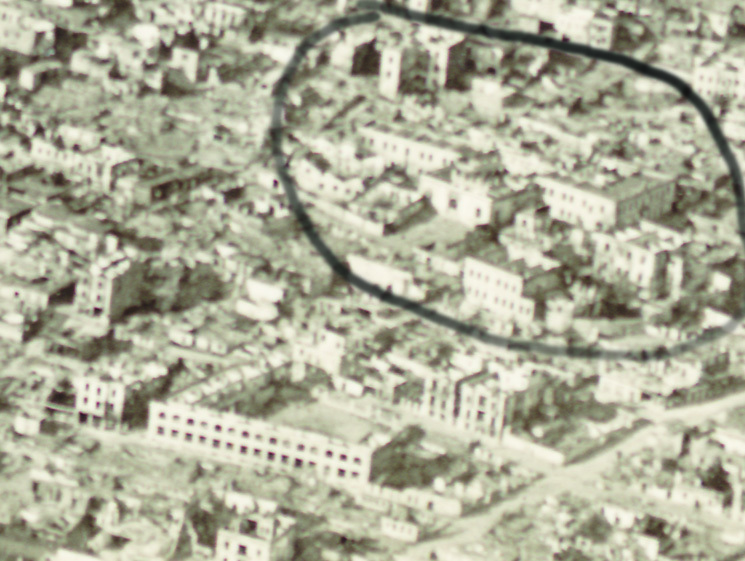 The fire of 1917 destroyed the centre of the city, including Rogos area. The rebuilding of the houses in the burnt area was forbidden, in order to prepare a new city plan for Thessaloniki. The new city plan involved new plots and streets. The residents remained homeless and unemployed for years. In favour of the re-planning process, every legal right on land was abolished and replaced with the right of the old owners to participate in the auctions for the new plots. The right for participation in the auctions was documented by a legal paper (ktimatographon), which confirmed the value of the old plot, on the basis of an estimation held by civil servants and lower courts. During the long period between the fire and the auctions, most of the old owners sold their “ktimatographa” to survive. Moreover, their plots were too small comparing to the new plots (>240m2), so they had no chance to regain their land, even if they participated in the auctions. 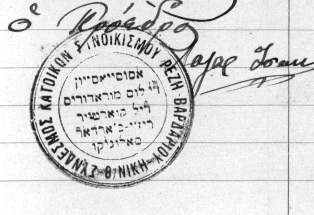 Beginning in 1917 and up until the exportation of the Thessalonian Jews to death camps (1943), the Jewish Community of Thessaloniki had to face the meagre problem of housing the Jewish pauper population. It dealt with it in the same manner it had dealt with the 1890 fire, i.e. by forming settlements at the city’s outskirts. However, this time the fire victims were many more and anti-Semitism made life in the distant settlements dangerous. After the murderous attack against the Campbell settlement (1931) the population in these distant settlements was considerably reduced. Hundreds of homeless families stayed in synagogues and schools even as late as 1939. A memorandum from the Jewish Community of Thessaloniki submitted to the Greek government (1931) with regard its two major problems: The anti-Semitic propaganda (“the restraining measures that were provided by the law proved to be insufficient”) and the housing of the paupers, a problem that the Community, despite the fact it had already housed 2.500 families, was “not able to solve on its own, without the State’s resolute support”. [Gennadius Library, Ph. Dragoumi archives]. A new memorandum (1934) on the issue of housing, which by then had become “agonizing”. Hundreds of families remained homeless after the attack at Campbell settlement and its abandonment by its habitants, as well as the expropriation of those land plots that were used to shelter pauper families. [Gennadius Library, Ph. Dragoumi archives]. The basic components of anti-Semitism in Salonika were the fear of the unknown and superstition. Even in Old Greece the “blood” libel survived and it goes without saying that there was more of it in the regions which were incorporated in Greece in 1912-13. A letter written by Congressman Isaac A. Siaki (11.29.1932) and addressed to the Prime Minister Panayi Tsaldari. It requested the dismissal of the director of the Press Office as well as the replacement of the director of the Foreign Affairs Office, both of the General Administration of Macedonia (the precursor of the Ministry of Macedonia-Thrace), due to their stated and factual anti-Semitism. The director of the Press Office was considered as the abettor of the attack against the Campbell settlement. Nevertheless he remained in his post longer than any of the other employees. (Gennadius Library, Ph. Dragoumi archives). April 4th, 1933: A telegraph from Ph. Dragoumi, the General Governor of Macedonia, requesting from the Chief of Police to advise EEE to stop … stoning the synagogues. (Gennadius Library, Ph. Dragoumi archives). “We know what the Jews are (…) They are the expropriators of our working people, the Greek-hating warms who devour the inner parts of our nation, those who prepare every disaster (…) The poisons they gave Greek people to drink throughout times, we will not be the ones to forget. This nation is brought up to hate our nation … These strangers, which Tsaldaris nowadays praises, are the ones who during the time of our enslavement collaborated with the tyrants… Our country should not be enslaved by the Jews... "(Newspaper Macedonia, 09.08.1934). The accompanying sketch depicts the Chief Rabbi visiting Prime Minister P. Tsaldaris and the Minister of Foreign Affairs D. Maximos. The large number of the homeless and pauper Jews (estimated up to 20,000 persons by the Red Cross in 1918) was the main problem of the Jewish Community in the mid-war period. The contribution of the Government and the local authorities to the solving of this problem, which coincided with the arrival of the Christian refugees from Asia Minor, was supplementary. To give homes to its homeless members, the Jewish Community established neighbourhoods mainly at the eastern and the western urban extensions of the city core. In the same time, a large number of Jews who were obliged to leave the centre of the city bought or rented houses in the new eastern neighbourhoods, near the communal ones. They preferred streets parallel to the axis of Dimokratias Avenue (now Vassilissis Olgas). Consequently, during the Mid-war period, although the old city core was not abandoned, the geographical centre of the Jewry moved to the eastern side of the city. 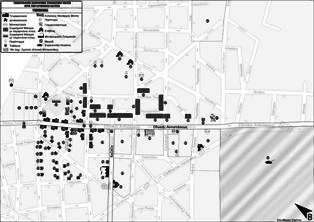 According to the available evidence we identified 23 synagogues at the eastern area of Thessaloniki. Besides the Bet Saul synagogue, the rest of the synagogues were relocated here from the center of Thessaloniki, due to the city’s re-planning. 10. The Aragon synagogue. Saint Photeini. 15. The Mograbish synagogue. Hirsch hospital. 19. The Har gavoa synagogue. Harilaou. 20. The Bet Israel synagogue. 4, Hymettou Street (151). 21. The synagogue of the settlement «6». 22. The synagogue of the Campbell settlement. In order to house the homeless fire-stricken families, the Jewish Community, bought 35 land plots and fields which were joined to form a large settlement, known as 151. The settlement occupied a total of 315,000 square metres. Initially, in the various types of houses that existed on the site (either old military barracks or new houses) 1,000 families were put up. By 1940 their number had risen to 1,200. Approximately 60% of these families were without means (due to widowhood, unemployment, old age or due to the existence of many children in low-income households.) They were depended on the help of the Jewish Community or the rare government services. A complex of houses, build on Papanastasiou Street (lower section of 151), to house the fire victims of the evacuated Campbell neighborhood. It was named the «New Campbell». A new need for the accommodation of homeless Jews evolved in 1927, when the Akçe Mescid neighbourhood, located in the burnt area, was demolished. After many requests submitted by the Jewish Community, a deserted British military camp with an area of 45 acres was expropriated to house the homeless. The Jewish Community bought directly from the owners the whole area and housed 210 families. This map illustrates the area of the Campbell settlement. The synagogue was located at point 12. The night of June 29th, a group of approximately 350 people rioted against the secluded Campbell settlement, murdered, raped, and burnt part of it. Along with the 700 habitants of the Campbell settlement, hundreds more of other settlements, from the city’s outskirts, fled to the centre of Thessaloniki where they were offered temporary accommodation at schools and synagogues. In April 1932 the trial regarding the events at the Campbell settlement took place in Veroia. “The Greek justice was triumphant”. All accused were pronounced to be innocent. The Baron Hirsch settlement was established by the Jewish Community following the fire of 1890, to house the fire victims, who, up until then, inhabited along the promenade of the city of Thessaloniki. Because of the fire, the area around the promenade was evacuated and planned anew with wider streets. The land plots that formed the Baron Hirsch settlement were bought in May 1891. The titles referred to a total of 35,000 square metres. Initially the Baron Hirsch settlement included 153 houses, which accommodated approximately 285 families (according to R. Molho). A 1931 report records 250 “small houses” (casicitas) and mentions that: “This [the settlements’] land plot is surrounded by a torrent. In between the houses that were built by the Community, there are smaller ones that belong to other people, who pay some rent for the land they occupy." An excerpt from a 1943 British map: The Baron Hirsch settlement extended from Moeses Street (nowadays Tsorlini Street), on the west, to the 26th of October Street on the east. In between the torrent’s banks and the railways lived poor Jewish families. The available documents indicate that the settlement’s habitants were bag vendors, manual workers and porters. The unemployment rates among the settlement’s population were very high. After the 1890 fire small Jewish settlements for the homeless fire victims were built on the west outskirts of the city, next to the swamps and to the factory of the Ottoman Tobacco Monopoly (Regie). These were the “Huts”, the “Bara” (= Swamp), the “Mezarlik” (= cemetery) and the Mustafa Arif settlement, which was located on the eastern section of the modern railway station. The 1917 fire caused new fire victims that fell into even more categories than before. All of them looked for cheap shelter at the area around the old tobacco factory. As a result the “Teneke mahala” [i.e. a neighborhood with tin huts] was formed, toward the area where Kallithea Avenue is today. “Teneke mahala” was enlarged in 1922-23 when thousands of refugees from Asia Minor and Thrace settled there and built their huts. The 1,400 habitants lived in shelters they constructed with their own hands, or in the cabins previously used by the WWI Entente Army or in huts made from soldiers’ food cans. The habitants were the poorest in the city: “When compared to the Regie settlement, that of Baron Hirsch was considered prestigious” (Gila Hadar). Many habitants were so poor, that they never went outside the settlement. Because of the nearby swamps, malaria claimed countless lives and almost every habitant suffered from it. Since 1919, as a result of the pressure exerted by the Red Cross, as well as by other international organizations, the State authorities established a settlement for the pauper fire victims at the area Regie Vardar (a public housing tenement). The homeless families took the houses over by force before the construction was completed. The buildings “were given on rent”, that is tenants paid rent to the State. The houses were newly built, however their number was disproportionately lower that the number of families that were accommodated. The public housing tenement was situated in between the Saint Paraskevi cemetery, Lagkada Street and Doudoular Street (today Koloniari Street). The site was eventually taken over by the “Axios” working class tenement. The seal of the Habitant’s Union (an organization which was a transformation of the kehila) and the signature of its chairman Lazar Isaac. [Thessaloniki History Center]. There were two more organizations (“clubs”) in Regie Vardar. The settlement’s synagogue was named Shaukat Shalom. This building housed the school of the Regie Vardar settlement. In 1939, 806 students were enrolled. It had a headmaster, Alberto Attas, seven school masters and schoolmistresses and two servants. Historic research progresses each time a new generation emerges; a generation which asks new questions about what really happened in the past. Searching for landmarks is a new way to search for the past. It is not only about the sites but also about the people who lived at those sites. 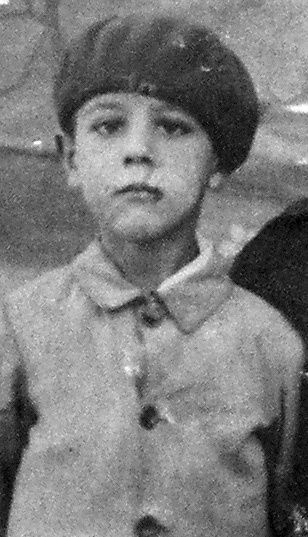 The photograph presented here was taken 80 years ago and depicts a child who lived at the Baron Hirsch settlement. His identity will remain unknown. But what we miss today, even more than his identity, is his countenance; just like we miss the countenance of thousands of children who did not make it to be here among us today. Their children would have been retirees by now. Their grandchildren and great-grandchildren would have been our lawyers, our doctors, our employees, our employers, our competitors, our fellow travellers on the bus, the fans of our sports team, our colleagues in our social fights, our friends. The boy’s grandchildren and great grandchildren are not here with us today, as are also missing many other children, who did not even have their photograph taken. They would have been tens of thousands by now. Each one of us has tens of thousands fewer acquaintances than he could have. Each one of us has fewer friends than he was entitled to have. And this is the genocide's actual long term repercussion.